Can Essential Oils Help Health Scars? You would have to be very lucky to get through much of life without having to deal with scars on your skin. Whether they are caused by acne, surgery or animal bites most of us will have a few battle signs dotted around our bodies. Of course, it is highly unlikely that you will ever be able to get rid of these scars completely. You are likely to have to carry larger scars such as those caused by surgery or major wounds around with you for life. I have a very unsightly scar on my lower abdomen caused by stomach surgery and as much as it would be great to get rid of it, I have accepted that it is a part of me and will always be a part of me. Even smaller scars will be difficult to eradicate completely and the best you can hope for might be to lighten the scar so as it fades away and gradually becomes almost unnoticeable. Fortunately for those of us who would like to be rid of unsightly scars, many essential oils provide a safe and natural solution. It is worth remembering that any scar treatment will not be a quick fix. You will need patience and treatment may last many months before you feel happy with the results. 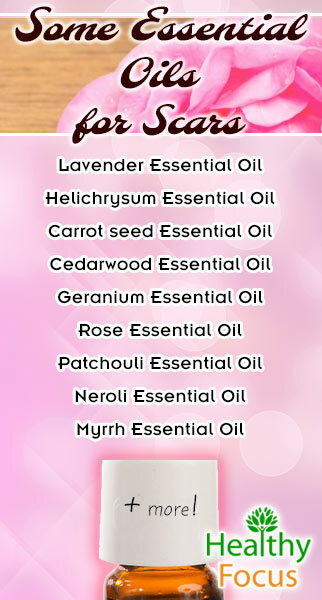 A number of essential oils have a great many properties that benefit the skin. Essential oils can be used to treat skin conditions like acne and eczema or simply applied to keep your skin looking youthful and healthy. Some essential oils are especially effective on blemishes, stretch marks and other minor scars because they contain the cicatrisant properties which promote tissue regeneration. 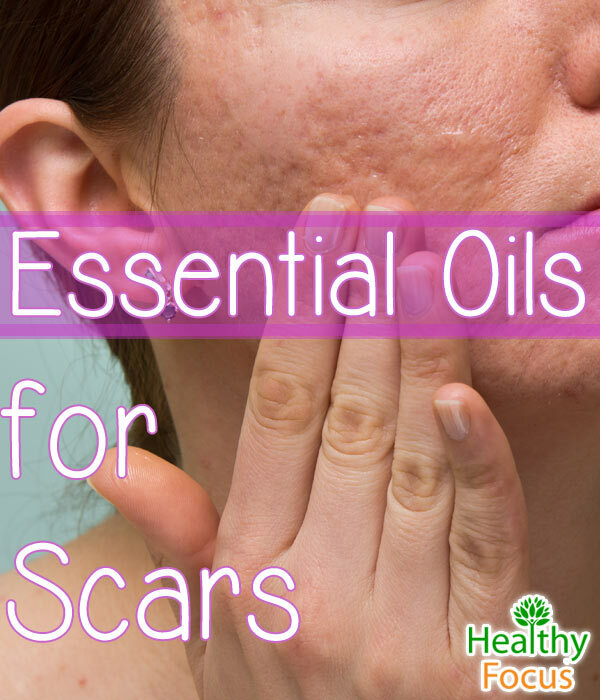 This article will take a look at the essential oils that have the best scar healing effects; they are not listed in any particular order and there are no guarantees that they will work. 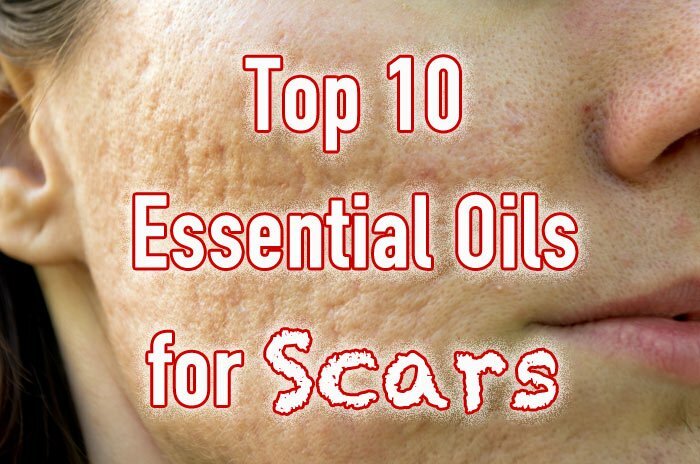 You might have to try several oils before hitting upon the one that you feel most happy with but they have made the list for good reason having all been used successfully to treat scarring. Lavender is one of the most popular and versatile essential oils. It is a very effective essential oil that can be used for a variety of skin conditions and is widely used to treat scars. Lavender essential oil can be applied to prevent new scar tissue from forming and also to reduce the evidence of existing scars. Unlike nearly every other essential oil, it is a very gentle oil that can be applied topically without the need for dilution although it should be diluted when being applied to fresh wounds. If you are desperate to eliminate or dissipate your scarring, helichrysum essential oil is one of the absolute best oils. There are obvious budgetary considerations when choosing your essential oils and helichrysum is extremely expensive. Because of its price, you may be better trying another oil first but if money is not an object, helichrysum has few equals. As well as its ability to treat scars and blemishes, it has a range of other skin applications and is a popular option for acne, eczema and psoriasis. Carrot seed essential oil has powerful antioxidant properties and is renowned as a tonic for the skin. It can help treat scarring whether caused by acne, burns or cuts while also working to strengthen your skin’s elasticity and reducing the signs of aging like wrinkles. Carrot seed oil is a popular ingredient in creams designed to treat eczema and psoriasis. Cedarwood essential oil is a very popular choice for skin health. It is able to maintain both oily and dry skin and works to expel impurities and excess tissue fat. As well as its general skin care benefits, cedarwood essential oil can be used to regenerate scar tissue and diminish the signs of older scars whether they are caused by acne, stretch marks or small wounds. Geranium is an excellent overall skin tonic. It is anti-inflammatory and antiseptic and has cicatrisant properties that will help eliminate or at least fade out any scarring when applied over a period of time. It is also helps to rejuvenate old skin cells and helps give your skin a fresh lease of life. Rose essential oil does not come cheap but it is well known for its many skin applications. When applied regularly, it can have a significant impact on the appearance of your scars. Rose oil also improves circulation and helps maintain your skin’s youthful appearance and elasticity. Patchouli essential oil does not have quite the same reputation and is less popular than many other oils but it should not be discounted when it comes to skin health and scars in particular. Patchouli has outstanding restorative qualities and is able to stimulate the regeneration of skin cells. It is both anti-inflammatory and cicastrisant and can help heal new scar tissue and fade out older scars. Neroli essential oil is another very expensive option but it has a great reputation for healing scars as well as treatment of numerous skin conditions. Myrrh has some powerful skin regeneration properties and is a popular remedy for a variety of conditions including acne and psoriasis. Myrrh essential oil also widely used to treat scars caused by burns, stretch marks and small wounds. It can help promote the growth of new skin around the area of fresh scars and over time causes any lasting scars to fade away. Frankincense essential oil is yet another great option for scars and skin health in general. This essential oil stimulates the regeneration of the new cells that grow over your scar tissue making the area smoother and the scarring less visible. The list above is by no means definitive and many other essential oils are well known for their ability to treat skin complaints and reduce the effects of scarring. Rosemary, hyssop, Calendula and juniper essential oils have all been used with great success. Clean the affected area with a mixture of warm water and 5 drops of lavender essential oil to help disinfect the area. Dilute your chosen essential oil with a suitable carrier oil and apply it to the wound. Cover the affected area with gauze or a band aid and change it several times a day. If the wound is so serious that you need stitches, it is important that you see a doctor as soon as possible. Your doctor might recommend that you don’t apply essential oils until the stitches have been removed. Make sure that you dilute your chosen essential oil with a base oil before applying it topically. Rosehip and hazelnut oil are considered to be excellent carrier oils when it comes to scarring. Don’t expect immediate results; scar tissue takes a long time to fade and there are no guarantees that it will work. You should however start seeing some satisfactory results within a few months.